Originally conceived as a tool for measuring the temperature of stars but re-named when it was realised that stellar temperatures do not follow a strict application of Wein's Law. This simple tool uses that law to calculate the temperature of a blackbody from a known peak wavelength. 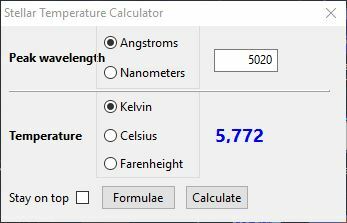 Input can be either in angstroms or nanometers and the result can be reported in Kelvin or degrees celsius or farenheight.